We will migrate Windows Server 2008 r2 domain to Windows Server 2012. 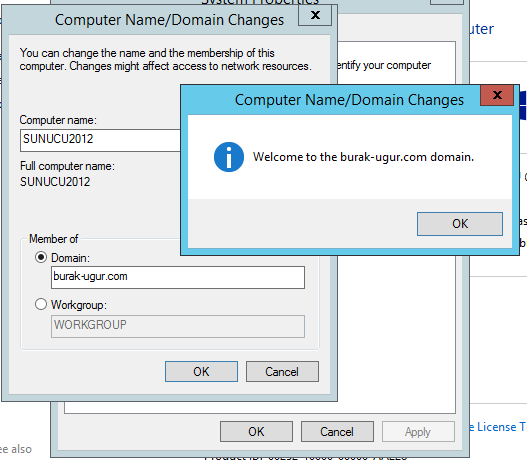 The construction of the domain running on Windows Server 2008 R2 will move into Windows Server 2012 r2 server. Note: I would definitely recommend you to take a backup of AD before the start of transition and FSMO roles in the transport process. Both servers also we are sure to turn off the firewall, date & time settings must be checked . 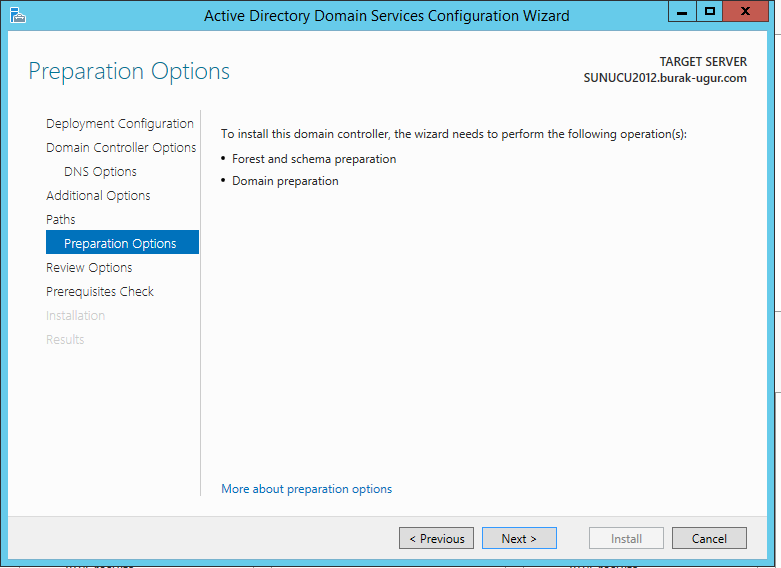 Server 2012 r2 installed on the server we include our domain, we restart the server. Once you logon on our server with domain account, Server Manager Console from Manage-> Add Roles and Features we choose. We continue with the next. Choose role-based installation, we continue with Next. 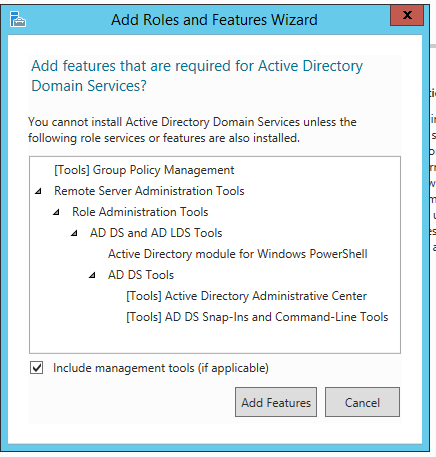 Select the server to do the installation, we continue with Next ..
We choose the Active Directory Domain Services Role on this screen. Features screen appears, we continue with the Next. In the Information screen, we continue with the next. We start the installation by clicking Install button. We show the continuation of the installation process. When we see “Installation succeeded on "servername.domain", we have completed a successful installation. We are opening from a warning message from the Server Manager console and "Promote this server to a domain controller" we choose. 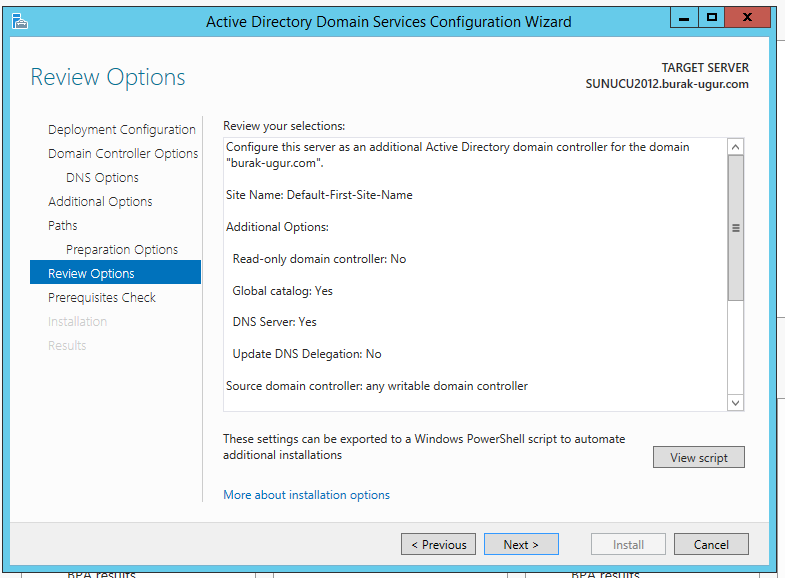 Building on our existing Domain Server 2012 r2 as we add to our server for Additional Domain Controller, "Add a domain controller to an existing domain" option select, we continue with the next. DSRM password: Here we will define the password to maintain the absolute case of an Active Directory restore will use this password. On this screen, we choose the server where the replication process will start that makes the new Domain Controller, so select "Any domain controller" if we continue to set the system to replicate the best controller. Next the best possible control. Active Directory Database, Log Files, weshow where to keep the SYSVOL files, we continue to remain under Microsoft's C drive. Continue with Next. 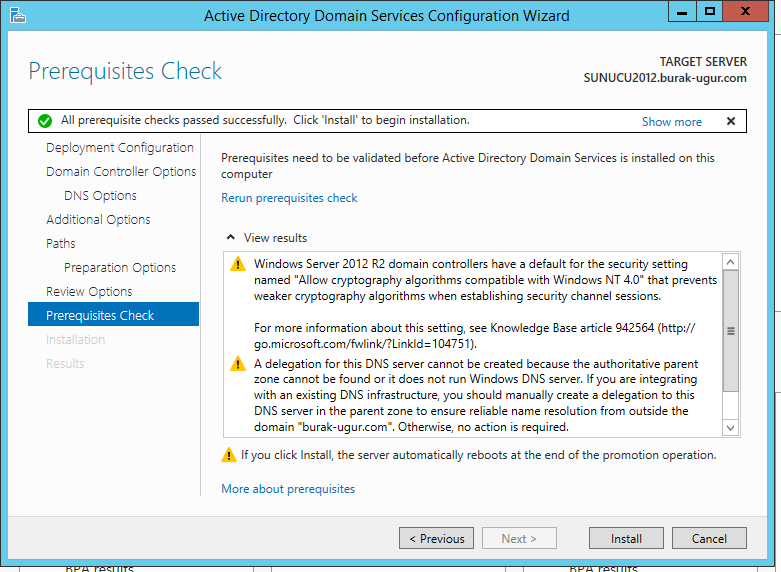 It automatically prepares Schema as well as domain as new server 2012 R2 features continue with Next on this screen. Screen can display the settings that we have done so far, we continue to check and Next. If the installation is prior to this point done correctly then you can’t continue with Installation. So you need to correct the Errors on this screen. Choose Install to start error correcting procedures. 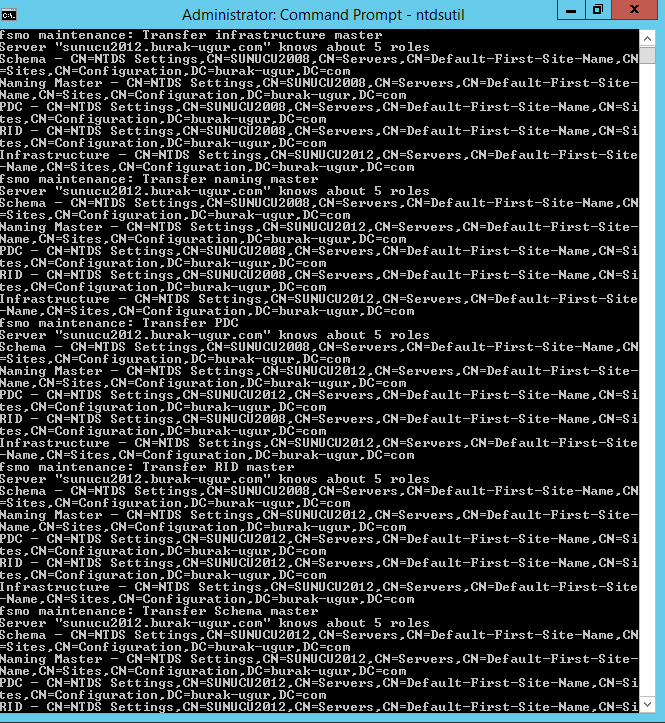 Server 2012 r2 installation is completed then we restart the server in our domain. 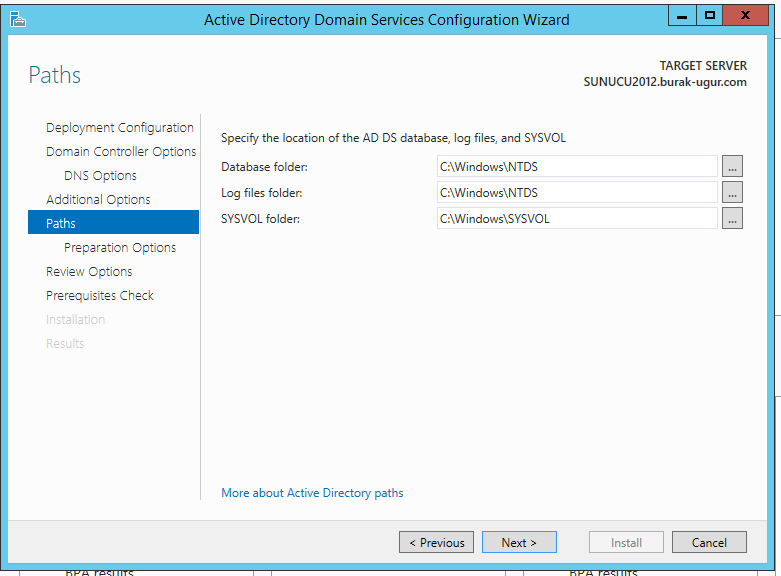 we see our new server added when we check Active Directory-> Domain Controllers OU. All the roles that I see on my environment SERVER 2008. 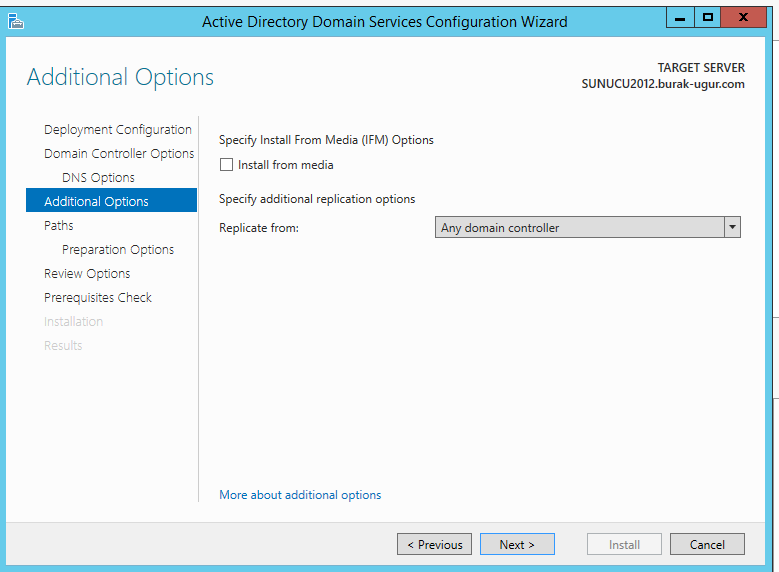 All FSMO roles we have established a new and Additional Domain Controller will carry on as we add Server2012 R2. Finally, we see the Results screen. 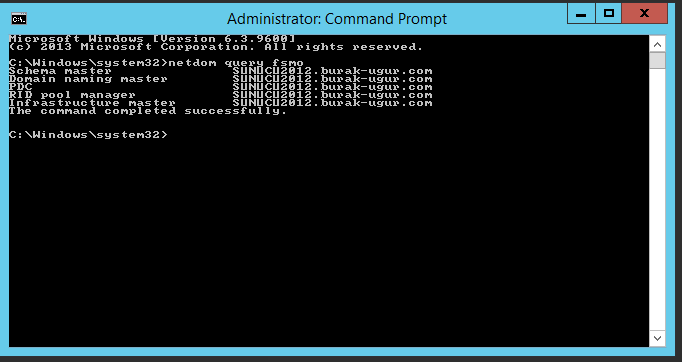 When we check with netdom command for the all FSMO roles, we see that they’re all transferred to the new SERVER 2012 domain controller. Thus our migration process are now completed.